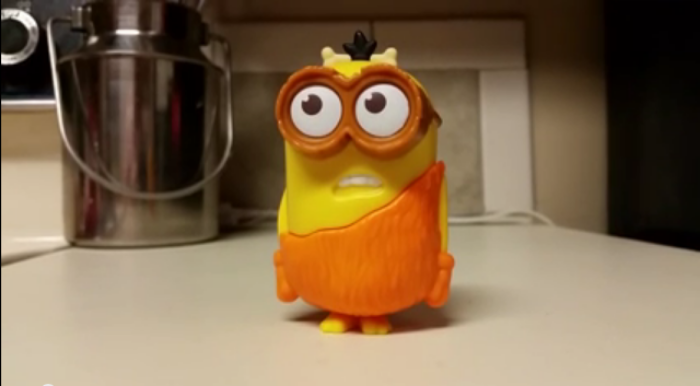 Controversial Minion Toy Allegedly Says the “F” Word - 2NGAW! The Minions are officially back! With their new spin-off movie launching on theaters across the world, these mischievous yellow beings are here to make everyone laugh again with their crazy antics and slapstick humor. Of course, the craze brought with it lots of merchandise ranging from school bags and t-shirts, to sleepwear and raincoats, to baseball caps and toys. Recently, popular food chain Mc Donald’s offered Minions Happy Meals on their branches worldwide. The kid-friendly package comes with some food items from the store and one Minion toy with every purchase. All in all, the company released 10 different collectible figures for this set. Kids and adult customers alike excitedly collected all the toys. However, some parents are expressing concern about one particular toy which is the Caveman Minion. Why? Well, as the video below shows us, this toy is not very kid-friendly in the first place. As reported by ComicBook, the video claims that this tiny cutie is actually swearing. It allegedly says “I’ll be damned” and “What the F—?” which shocked many parents. They say they did not expect this one – especially from a Happy Meal toy! The video went viral online and has been viewed more than 5 million views since being published on YouTube just several days ago. Although they have not commented on the topic yet, the creators have always said that the Minions are speaking Minionese – a combination of different foreign languages and some non-sensical words and phrases. Do you get one of these toys from the food chain? Do you think this Minion is really foul-mouthed? Are the parents correct in being very concerned about it? Leave your thoughts about this in the comment section below. Also, feel free to share this on your social media.